Fourtitude reports Audi's boss man says the bruiser Audi V12 TDI concept shown in Detroit may be US-bound. Nonetheless, those in Herr Rupert Stadler's charge have more definitive news on the other hot Q7 diesel arriving one ocean away. It's the 4.2-liter TDI, which produces 326 hp and 561 lb-ft of torque. Audi says it's the most powerful diesel SUV on the world market. It barely edges out its cousin the Touareg V10 TDI, which produces 310 hp and a near-miss 553 lb-ft of torque. But edges out it does. In the Q7, zero to 60 takes just 6.4 seconds and it tops out at 147 mph. No word yet on price, but the sporting TDI will arrive in Euro dealerships this summer. 240 kW/326 bhp and 760 Nm of torque - Audi proudly presents the most powerful diesel SUV on the world market. A state-of-the-art eight-cylinder engine with common rail fuel injection and Piezo injectors not only stands out on account of its sheer output but also demonstrates outstanding efficiency: the 4.2 TDI has an average fuel consumption of just 11.1 litres of diesel per 100 kilometres. The Audi Q7 4.2 TDI transmits its power through a six-speed tiptronic gearbox and a sportily tuned quattro driveline, which in normal situations splits propulsive force 40 percent to the front wheels and 60 percent to the rear axle. Audi's "adaptive air suspension" is standard on this most powerful of diesels - it unites dynamic handling with the ride comfort of the luxury class. Like all the engines in the Audi Q7 series, the 8-cylinder diesel heralds from Audi's new V-engine family. With a displacement of 4,134 cc, the large TDI has a maintenance-free chain drive on the gearbox side for its four camshafts and ancillaries. The angle between the cylinder banks is 90 degrees, the cylinder spacing 90 millimetres, the overall length just 520 millimetres. The crankcase is made of the high-tech material vermicular graphite cast iron. This forms the basis for the light weight of the engine - just 257 kilograms. The 4.2-litre TDI develops 240 kW/326 bhp at 3,750 rpm. Between 1,800 and 2,500 rpm it induces its impressive pulling power onto the crankshaft - 760 Nm of torque. The most powerful diesel engine in the SUV segment gives the Audi Q7 the sportiest performance of all diesels. The premium SUV sprints from 0 to 100 km/h in just 6.4 seconds. On the motorway it can reach a top speed of 236 km/h. The Audi Q7 4.2 TDI is equipped as standard with the six-speed tiptronic automatic gearbox. The dynamic shift program (DSP) manages the gearshifts, whereby it orientates itself to the driver's style and to the characteristics of the road. A special sport programme - the S programme - supports a particularly dynamic driving style. The driver can intervene at any time, either at the gear gate for the selector lever or at the optional paddles on the steering wheel. As the tiptronic in the Audi Q7 was designed for high torque from the very outset, it does not need to be specially reinforced to team up with the V8 diesel engine. The running gear on the Audi Q7 4.2 TDI supports this dynamic presence. And it superbly masters all of these challenges - whether in rough terrain or on the road, where handling characteristics, driving safety and comfort set the standards. Adaptive air suspension, fitted as standard, rounds off the outstanding character - the combination of pneumatic suspension and electronically controlled damping with dynamic roll stabilisation forms the perfect synthesis of sportiness and maximum rolling comfort. The Audi Q7 running gear is characterised by its high degree of sophistication. All four wheels are independently mounted on double wishbones. The axle components are made largely of aluminium. The servotronic steering is distinctively direct and precise, giving a feeling of excellent road contact. The Audi Q7 4.2 TDI runs on sporty 18-inch alloy wheels with size 255/55 tyres. Behind them, the four brake discs are internally ventilated and generously dimensioned - 350 millimetres in diameter on the front axle and 358 millimetres on the rear axle. The front brake callipers employ 6-piston technology, like on a top sports car. 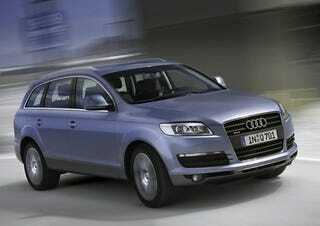 The new Audi Q7 4.2 TDI will be in the showrooms in the early summer.